The ProFile® Carry Forward service allows existing client information from previous year’s files to be “carried forward” into a new file. Preparers can also carry forward a previous year’s ProFile file or a file prepared using a competitor’s product, as well as multiple files at one time. When you carry forward past year files, information from the previous year will always overwrite any file template data. Using a template with default settings will not cause data loss during carry forward. 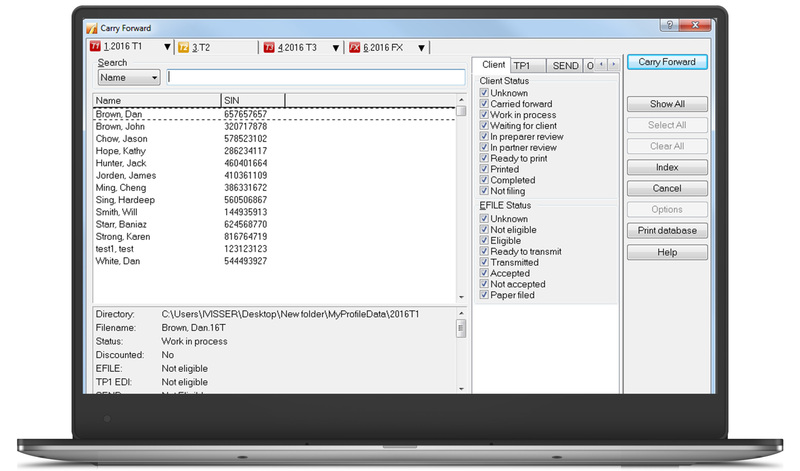 This program is just one advantage provided by ProFile’s Client Explorer, which features intuitive batch functionality. ProFile users can build and EFILE files to Canada Revenue Agency (CRA) for multiple clients and returns at once. Doing so creates a set of individual and client files ready for EFILE (a batch), which ProFile sends to CRA or RQ all at once. With ProFile, there is no limit to how many returns you can EFILE. Another advantage is you can increase your productivity by filing multiple returns in one session with batch processing. You can also batch carry forward and print multiple returns too, ensuring your time is well spent. It is simple to print the same form for multiple clients at once in a batch. For example, a ProFile user may want to print a form for each client so that is can be mailed for the client’s signature. Note: when printing forms from multiple clients at the same time, you can only print forms from files of the same module and year. Click here to learn more about Carry Forward and other key ProFile features.